Over the last decade Denmark has experienced an increase in the international export of TV drama series. In spite of Denmark’s less than perfect position as a small TV market with content in a minority language, Danish TV-series have sold worldwide. But which countries have bought the content and when and where has the content actually aired? As a small nation Denmark faces several difficulties exporting TV content. As described by Sinclair and Cunningham in New Patterns in Global Television (1996) Denmark is part of the Anglo-Saxon/European region, where English is the main or an important second language, and also the Scandinavian sub-region. International export and import of TV-content within the regions are not unusual, but the centre-periphery-structure means that small nations such as Denmark usually import international content but do not export as much. This combined with the fact that Danish is a small language, cultural discount, and a very small market means that there are several barriers that seemingly makes it difficult for Danish TV content to travel across the world. When the Danish drama TV-series Unit One won an Emmy in 2002, Danish TV-series started to gain more international attention. Unit One (2000-2004) aired on seven international TV channels, and The Eagle (2004-2006) aired on 16 international channels. This was considered a great success at the time. But when The Killing (2007-2012) was sold to more than 118 nations it broke all Danish records by far, and the Danish media proclaimed drama TV-series to be Denmark’s new greatest cultural treasure and export. According to the Danish newspapers the whole world was now watching Danish TV drama. 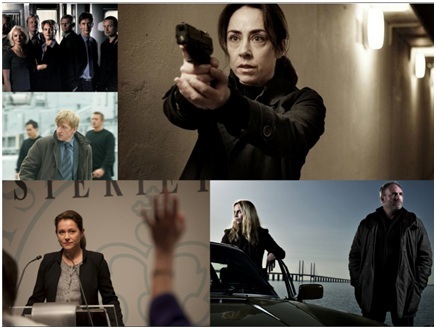 Since The Killing the sales numbers for Danish TV drama series have increased dramatically and several of the Danish drama series produces in the following years such as Borgen (2010-2013) and The Bridge (2011-) also sold significantly more internationally than previous Danish TV-series. The international demand for Danish content has led to a small increased sale in some of the older Danish TV-series such as Unit One (2000-2004), The Eagle (2004-2006), but also content produced prior to the Millennium such as Taxa (1997-1999) and Monopoly (1978-81). As the map shows, Danish content has travelled beyond the Anglo-Saxon/ European geo-linguistic region, and especially outside their Scandinavian sub region. 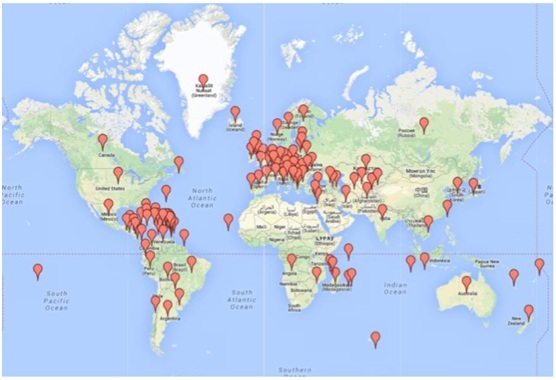 So geographically you could say that Danish TV-series have gone worldwide. However if you look at which channels that show the Danish series and the timeslots in which they are shown the image alters. The table below shows a small selection of countries and channels that has aired one or more of the Danish TV-series. These 10 countries have bought at least one of the five Danish TV-series illustrated above. These series have been shown it on 11 different channels. Out of these 11 channels, 3 can be categorized as main channels and the rest are secondary. More than half the channels have shown the content after 10pm placing it in the late evening slot, and on all the channels reruns of the content are shown after midnight. The further Danish TV-series travels the more the content is no longer perceived as primetime material, but is but instead used by commercial niche channels the further to fill out their late night/ early morning slots. This raises the question whether the content has actually been watched by all that many people world wide. It seems unlikely. When only looking at the sale numbers from these series over the last 10 years it is clear that these recent sales figures constitute a huge success for DR. A success that opens new doors for future financing and co-productions as The Team (2015) was an example of and the possible 4th season of The Bridge. No doubt that this sales increase means the world to Denmark, DR, and DR Sales, but it is still unclear how much the Danish drama TV-series mean to the world. Data regarding sales numbers and buying channels are from sales lists completed in a BA-project (2013) by Maja Hermansen, Line Kjær Røge, Sofie Thorup Mikkelsen, Maria Mørch Brinkmann Skytte & Katrine Duedahl Johansen from Media Studies at Aarhus University.